US President Donald Trump's administration has announced an ambitious plan to usher in a new "Space Force" as the sixth branch of the military by 2020, but the proposal was scorned by opponents and may struggle to get liftoff in a divided Congress. Mr Trump has strongly championed the idea of creating a space-focused military service with the same stature as the air force and the army, turning his dreams of a "Space Force" into a rallying cry for supporters at political events. His 2020 re-election campaign sent a fundraising email yesterday asking supporters to vote on their favourite Space Force logo for future Trump campaign merchandise, offering a choice of six. 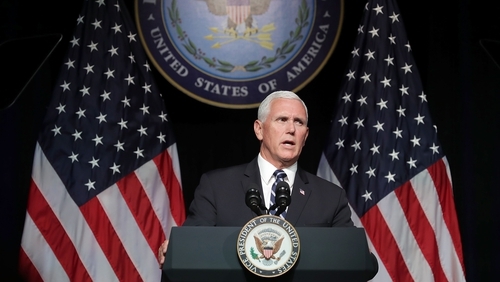 US Vice President Mike Pence, in an address at the Pentagon, described the Space Force as "an idea whose time has come". He said: "America will always seek peace in space, as on the Earth. But history proves that peace only comes through strength, and in the realm of outer space, the United States Space Force will be that strength in the years ahead". He added that Congress must now act to establish and fund the department. But critics view its creation as an unnecessary and expensive bureaucratic endeavour, a vanity project that simply strips away work already being done effectively by services such as the air force. "Although 'Space Force' won't happen, it's dangerous to have a leader who cannot be talked out of crazy ideas," Mr Schatz said on Twitter. Senator Bernie Sanders said "maybe, just maybe" the government should guarantee healthcare "before we start spending billions to militarise outer space". However, although Pentagon leaders, including US Defense Secretary Jim Mattis, once opposed the idea of a Space Force, they lined up yesterday to offer their support. A Pentagon report included interim steps toward the creation of such an organisation. A unified combatant command known as the US Space Command would be formed by the end of 2018, according to a copy seen by Reuters. In a nod to the Air Force's current role, the Pentagon report recommended that the Space Command be led initially by the commander of Air Force Space Command. One of the arguments in favour of devoting more resources to a Space Force or Space Command is that US rivals such as Russia and China appear increasingly ready to strike US space-based capabilities in the event of a conflict. "It is becoming a contested war fighting domain and we have to adapt to that reality," Mr Mattis said. Former astronaut and retired US Navy Captain Mark Kelly said that while Mr Pence was right about the threats in outer space, the military was already handling them. "There is a threat out there but it's being handled by the US Air Force today. It doesn't make sense to build a whole other level of bureaucracy in an incredibly bureaucratic Department of Defense," Mr Kelly said.